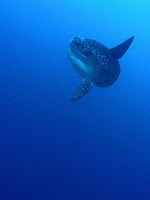 “Mola-Mola” Sun Fish can be seen in Nusa Penida, Bali mostly during July – end October, so people say. 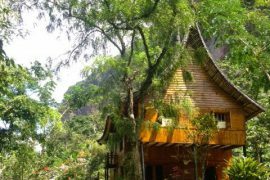 Nusa Penida, located in off the southeastern corner of Bali, is about one hour boat ride from Sanur Beach. This dive site is famous for its beauty, and the “Mola-Mola” Sun Fish.. but be careful of the strong current and be ready to dive in a 21 degrees water temperature. Our group went to Crystal Bay, where people usually see the Mola-Mola. This fhuge fish, up to 4 meters diameter, has weird shape. It usually lives in 300 meters depth, but during the season, it goes up to 30 – 40 meters to get cleaned. 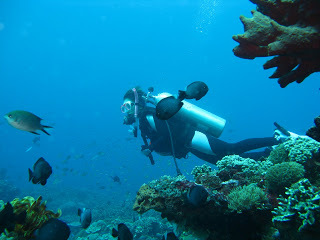 We had 2 dives here, the visibility was around 20 – 25 meters. 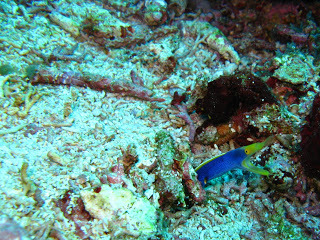 The reef life was beautiful — the corals, the fish, it felt like I walked in a garden… very nice. We dove down to 30 meters… and the dive master, Nicky, even dove deeper, tried to find the “Mola-Mola”, but we weren’t lucky :(. Second attempt was also unsuccessful. “Where’s it?? ?”, I asked. Maybe the Mola-Mola was too shy, so it was hiding somewhere…. 🙁 Damnnnnn!! Ah well… it means that I have to come back next time! Even though there was no Mola-Mola, I had great dives there. 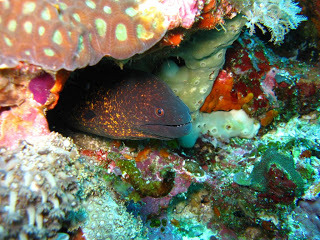 Unicorn fish, titan, trigger fish, moray eels and blue ribbon eel were some of the fish that I saw apart from the “usual suspects” – moray idols, angel fish, butterfly fish, surgeon fish, etc. The blue ribbon eel was pretty impressive. It looked tiny and cute with its fluorescent blue color and yellow on the mouth part, yet dangerous at the same time. Ouch! Third dive, we dove in a dive site called Toya Pakeh. There was a little cave in which we could go in. 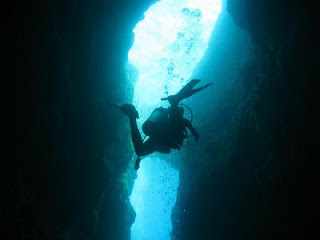 My first cave dive ;). When we’re inside the cave, we could actually ascend to breath some fresh air. Several bats living there. Interesting, eh? We took some pictures there before continuing our journey underwater. Due to the strong current, we had difficulties to get out of the cave. My goodness…. it was really hard. I tried to swim as fast as I could, but the current kept on pushing me back. My buddy also had a hard time. She got carried several meters back and hit the walls of the cave. Both of us are skinny, so it’s pretty easy to get carried away by the strong current! 😛 hehehe.. When I finally got out of the cave, my buddy was still inside with the dive master. She was still struggling. And guess what, even us, who were waiting at the mouth of the cave, had to hold on to rocks to be able to stay at the same spot! Geez!! So, that was the last dive of the day. Pretty interesting. We dove around 45 minutes, swimming around til suddenly in one spot the temperature dropped. It was pretty chill. If 20 degrees was already cold for me, I couldn’t imagine diving in winter time… must be freezing like hell!!! note: the “Mola-Mola” picture was taken by Coppertane. 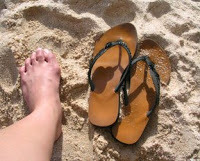 Does this mean u’ve attained that diving license? Coool….!!! & Congrats on attaining your diving livence.